Last week, the Garden State welcomed the first day of spring. Sure, it might still be almost-freezing, but warmer temperatures are right around the corner, and with it, fresh and lush landscapes! Our used car dealer near NY has some ideas for the best “green” cars to help you blend in with the scenery- or do your best not to impact it! Thanks to the growing reliability and durability of cars, trucks, vans, and SUVs, it’s a better time than ever to pick up a used hybrid, as that technology is no longer quite as brand new, but still runs reliably. NY shoppers can also check out our selection of green used cars that net over 30 MPG, helping to minimize your carbon footprint on the road. You probably won’t be surprised to find that in today’s eco-conscious landscape, some of the country’s most popular models are hybrids! For example, the Toyota Prius’s second generation spans the 2004-2009 model years and is a great find at a used car dealership. As America’s best-selling hybrid, you can always count on any generation of Prius to deliver a smooth ride, agile handling, and great gas mileage thanks to its precise engineering. It’s a head-turning vehicle exuding style! A popular alternative is the Honda Civic Hybrid, which sustains an excellent value due to its durable battery. Need a little more space for your stuff? Don’t worry, spacious SUVs aren’t the gas guzzlers they used to be. In fact, the fan favorite Ford Escape has come in a popular hybrid model since before fuel efficiency and carbon footprints were of utmost concern, and it needn’t be late model to achieve fantastic mileage. The 2004-2011 Ford Escape Hybrid nets up to 29 MPG on the highway, which is why they’ve been a top pick for taxi fleets as well. There truly are hybrids for everyone, so if you’re interested in spending less money at the pump and keeping our planet green to celebrate spring, visit New Jersey State Auto Auction today! In crowded north Jersey, it’s easy for any business to get lost in the mix. However, our Jersey City used car dealership has found that the best way to stay successful is to deliver on every promise and cater to customers with utmost dedication. That attitude is what got us a Consumer Satisfaction Award from DealerRater.com! DealerRater.com is the leading authority on quality dealerships and service centers, counting on customers to leave feedback about their dealership experience. It helps potential customers determine where to shop, and helps us identify strengths and weaknesses in our business. In order to receive this award, the contenders must be at the top based on their PowerScore. In a state as heavily populated as New Jersey, it’s an honor that we were able to receive this award for the third year in a row! Our dedication to our customers is peerless, and we have no intention of slowing down anytime soon. 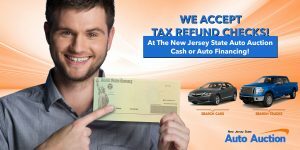 We offer a huge selection of new-to-you vehicles along with a huge range of used car financing options for Jersey City shoppers. Whether you’d prefer to purchase your vehicle by auction or directly from our inventory, you know you have plenty of options when you shop with us. As is made clear on DealerRater.com, no matter who handles your transactions, you will leave satisfied! In addition to our helpful and knowledgeable sales team, we also have a superb service team. Our trained technicians can take care of your car, whether you need a quick tune-up or a more in depth repair. We’ll treat you with the professionalism and honesty that you’re entitled to! Come see why people are flocking to our dealership and giving us rave reviews. Visit NJ State Auto Auction today!